This term, in an effort to expand my resume, I worked on grant-writing research and coordination. Seeking to learn more about the funding streams that power the work I most long to do in life, the folks at Vocoform generously agreed to facilitate my learning. 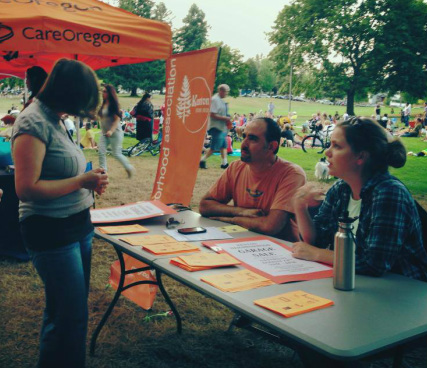 Vocoform is a Portland nonprofit that began in 2009. It is an organization committed to empowering adults through mentorship and supported professional experiences. Internships with Vocoform are a place for adults to explore and develop a sense of calling during their placement in Enterprise Training Labs. These ETL's are local businesses through out the city owned and operated by Vocoform, and are the platform through which students gain professional experience, develop contacts, and enhance existing skill sets. Knowing that exploration and mentorship can have a powerful influence over the trajectory of an individual's life, Vocoform's central focus is to create opportunities for young adults to practice and pursue vocation. Vocoform practices Values Based Enterprise, a concept centered on "rethinking how we do economy." Vocoform's curriculum cuts right to the heart of pervasive issues of social justice and equity in our economic systems and asks students to consider and imagine creative alternatives. 1) As described above, they've created a rigorous program challenging systemic barriers and inequities that result in sometimes insurmountable obstacles for individuals, families, and entire populations. 2) It is an organization very close to where I live. As a public health student, I have developed a very strong sense of community-led social change. That is: the people most informed and equipped to carry out meaningful improvements to a community's health outcomes, crime rates, educational attainment, etc. are the community members themselves. I am very interested in policy-based initiatives that maximize the intelligence and expertise in our communities and supply them with the tools and resources they need to evaluate, plan, and implement change effectively. Working in my community began in my heart a long time ago. Historically, the projects that excite and inspire me the most revolve around ideas I've come to find elaborated more clearly in a research method called CBPR (Community Based Participatory Research). Here I am presenting a PhotoVoice project last Fall (2013). The work I did on the research project above, inspired me to seek opportunities to become more purposefully involved in my immediate community. Here I am volunteering at a local concert. In North Portland, getting involved in my neighborhood association has increased my understanding of city resources and processes. I've attended several meetings in the past year and have exercised my curiosity and knowledge of things like: air quality, community outreach, equitable access to recreation and healthy foods, etc. Most importantly, I've expanded my contacts list. Within a few square miles of my home, I have access to an abundance of informed, energetic friends who continue to be a source of encouragement, collaboration, and mentorship.